How much dental x-ray radiation am I exposed to at the dentist? Are x-rays necessary? An exam with 4 bitewings is about 0.005 mSv, less than one day’s worth from natural background radiation, and is the same exposure amount from an airplane flight of ~2 hours. Such are legitimate questions patients may ask when they visit the dentist for their annual checkups and cleanings. On should consider that EVERYONE is exposed to radiation EVERYDAY. The amount exposed depends on where you live, how much time you spend outdoors, and even your occupation. 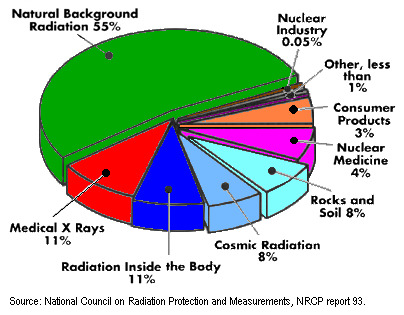 By far radon is the largest contributor to background radiation. Over 50% of daily radiation exposure comes from radon (radon has no smell, no odor, no taste, no color, and is present in your house due to trapped pressure from the rocks and soil underneath houses and buildings). Other sources of daily radiation include the sun,daily consumables, some tests required at the hospital, external rocks and soils, and various internal elements in the human body. In comparison, dental x-rays amount to less than 0.1% of the annual radiation exposure. WHY ARE X-RAYS NECESSARY AT THE DENTAL OFFICE? Rest assured your dentist, hygienist, and assistant subscribe to the as low as reasonably possible principle, which means x-rays will only be taken if absolutely necessary at the lowest level and with your consent. If you have any questions or concerns regarding dental x-ray radiation at the dental office, be sure to consult your family dentist.